Last week we told you that January is the heart of ‘engagement season,’ better known to many as ‘wedding booking season.' Everyday this time of year more brides, grooms, parents and wedding planners are searching GigMasters for the wedding entertainment of their dreams - so you performers better be ready! 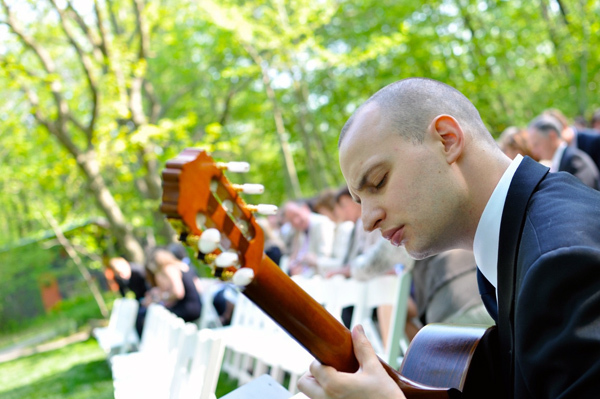 To make our clients' dreams come true we want to give you some wedding booking and gigging pointers direct from some of our top wedding performers, starting with classical guitarist Jim Perona (Wheaton, IL). Jim joined GigMasters in September of 2010 and has already landed 38 bookings through GigMasters, many of which are wedding ceremonies, wedding cocktail parties, rehearsal dinners and other wedding-related gigs. Photos Jim has a number of good shots of himself in performance, including a few shots of him playing at weddings. And look! He has a tie on! This really makes it easy for a bride-to-be to picture him performing on their big day. Video A high quality video of Jim performing a number of different tunes. Notice how it’s not a shakey video shot from a phone? Hear how the sound isn’t blowing out your speakers? These are good things. It only takes a little effort (and a steady camera) to create a good video. Audio Jim has included a wide range of songs for your listening pleasure. I bet if you asked him, Jim would tell you that he has included some of his most requested wedding songs. Smart guy that Jim! You’ll also notice that Jim took the time to clearly and thoroughly fill out his Upcoming & Past Appearances, Song List and Description. A few minutes of work now is worth the payoff later. It all starts with being timely, informative, engaging and grammatically correct in your correspondence with the client. If the client is deciding between a handful of musicians, think about what you can offer to the client that is unique to you, and how that can be a positive, memorable aspect of the wedding. Think about it: we can all play a traditional version of “Canon in D,” so what sets you apart? Of course, you can’t land every gig, but the success I’ve had on GigMasters is due in large part to me finding a performance niche. 2. Arrive early. Arrival time should be worked out beforehand. Make sure you allow yourself ample time to set up. Sometimes, your designated spot will have to be altered the day of the ceremony (i.e. there was some sort of miscommunication between the bride, photographer, coordinator, and florist), so an early arrival will allow you to get comfortable in whatever spot you end up in. This can be crucial if you were relying on being able to see the wedding party make their entrances. If you are placed in a spot where your back is turned to the wedding party, you’ll have to work out some kind of visual cue with the officiant. 3. Relax! Yes, a little bit of nervous energy can keep you sharp, but remember that you were chosen for a reason - the client thought highly enough of you to hire you. Take that confidence with you to the gig and have fun! Got any wedding booking or gigging tips you care to share? Leave a comment and let us know!